Thinking Person's Guide to Autism editors Carol, Shannon, and Jennifer recently attended an event celebrating the work of Kate Winslet. 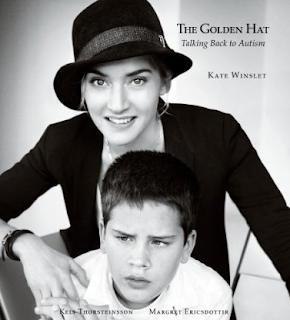 Kate has a new autism awareness and fundraising book coming out next month called The Golden Hat: Talking Back to Autism. We were told the book is meant to shine "a light on a world very few people understand [...] about people with profound autism and the challenges they and their families face every day, as well as all the 'beautiful potential' of people with autism." The Golden hat book (which Kate fought "tooth and nail" to get made) features photos of Kate's celebrity friends Tom Hanks, Meryl Streep, Kobe Bryant, Conan O'Brien, and many others wearing Kate's old Trilby Hat, and saying something about who they are, what is important to them. Some of these statements are poignant: Reese Witherspoon said "Love one another." Some are amusing: George Clooney said, "I'm sorry about Batman and Robin." The celebrities are featured alongside non-speaking people with autism, who offer their own statements, like Keli's "I am real." Short term: Improve awareness of the capabilities of people living with autism. Long term: Provide assisted living campuses where those with severe autism can receive education direction and job training in an environment that supports their individual strengths. At the event, we were told "the Golden Hat Foundation doesn't just raise awareness about autism, but it's proof of what happens when determined moms band together to create change." Margret talked about the terrible feeling she used to have, of not being able to help her own child; and how important it is for people to understand that non-speaking Autistic people can be capable, can contribute to society. A final goal: Kate and Margret want to get The Golden Hat book into the hands of every educator in America, so those educators can understand how capable students with autism are. Shannon and Jennifer joined the event via conference call and were not able to view the Golden Hat team's autism videos, but Carol was at the event in person and had constructive criticism on the videos and the project in general. We hope Carol's insights can help shape and fine-tune The Golden Hat Foundation's vision and goals. Carol: From what I was able to process, the videos were definitely a notch above the typical "helpless kids trapped inside the prison that is autism." Everyone looked happy, no meltdown shots, autism-as-kidnapper metaphors, or parental suicide/homicide nightmares. There was a serious attempt at a balance between autistics and parents expressing themselves, all in a pretty calm positive way, all of which I like. The Golden Hat Foundation focuses on empowering non-speaking autistics and their families, which allowed their videos to present a refreshing change from the usual interview montage of one token non-speaking adult literally outspoken by autistic chatty Kathies like me. What was missing and would have like to have seen were a few substantive comments by older non-speaking kids about their specific goals and how they think The Golden Hat could help them achieve those goals. Common problem, in my opinion, with parent-produced videos. It's no longer enough, at least for me, to show that autistics are people too and some of us are even pretty happy people. Like I said during the comment period at the event, independence, and contentment are nice, but they're not enough -- what I want for my son is indispensability. I think Golden Hat needs to set bar higher by demonstrating what autistics, whether they use spoken language or not, contribute to the world because of, not despite our autism. We were told the mission of the Golden Hat Foundation is "the establishment of innovative campuses that offer people with autism the opportunity to learn to communicate effectively, receive an education, job training and enjoy recreational activities, all within a supportive social network." The campuses were described to us as having three levels of care: 24 hour care; assisted living so folks can have their own apartment but with accomodations like wearable sensors that turn the stove off when they go through the front door; and totally independent. We were also told "There's a thought that if parents wanted to, they could build a home and live with their children there. Why an isolated campus instead of integrating out? Because it's too hard to change people's attitudes in such a short time -- it'll be easier to bring people in, e.g., let the people who work there live onsite. Start showing what people with autism are like, what an inclusive campus can be like." Carol: The community housing campus plan is pretty. Sounds like they'd be open to input from universal design experts, and I'd like to think some of those folks would be autistic. I have no problem with intentional communities. I can see why their model would appeal to many autistic people and their families, so they'd be able to pull in residents, and I certainly admire the commitment to inclusion. My question is, if they're trying to lure non-autistic people into an autistic community, rather than integrate autistic people into a primarily non-autistic community, then how exactly do they propose to bring in neurotypical (NT) people on a large and consistent scale? As all family members know, it can be a challenge to spend a lot of time around autistic folks, and unless NTs have a vested interest in an autistic individual, I'd think they would need a heck of an incentive to live on, work on, or even consistently visit such a campus. Not sure exactly what that incentive would look like. From the Golden Hat Foundation website: People with autism carry a double burden. In addition to their daily speech and sensory challenges, they must also cope with negative attitudes of society, inadequate support for their needs and, in some cases, outright discrimination. Sadly, people with autism are often labeled “cognitively impaired.” Because communication skills are an integral part of how most professionals determine a person's intelligence, their communication impairments can severely affect their ability to perform on standardized intelligence tests. Carol: I think Golden Hat has to be a little more careful with their phrasing in their laudable intent to make the point that autism does not necessarily equal intellectual disability. My kid and Margret's kid, don't have intellectual disabilities, but some autistic people do. There is a subtle, but significant difference between saying autism and intellectual disabilities are not inherently related and saying they are by definition not related. I very much doubt Golden Hat wants to say that only autistics like me or my child have something to contribute, but that was how their message came across.